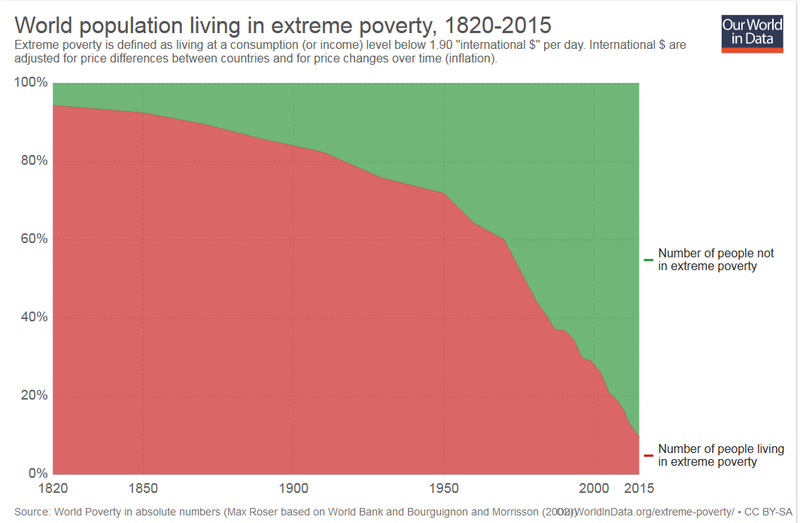 The visually powerful and educational four-minute video below is a 200-year summary of the incredible progress of the world. It is from Hans Rosling, a physician who cured paralytic disease and co-founded the Swedish chapter of Doctors Without Borders. He is currently a professor of international health and has compiled an amazing amount of UN data into something truly useful and devoid of politics and emotions. Hans shows that when you take a step back, the world is making tremendous improvements in life expectancy, income, and wealth distribution. Yes, there have been, and will continue to be, great difficulties, and there is always a real and painful crisis going on somewhere in our world. Investors watch the news and are deluged with facts that (while important) are not relevant to long-term investing. While the news can make a pessimist out of anyone, a review of history can make a faithful optimist out of everyone. Therefore, to some degree, faith in the future can come down to where we place our attention. If you have not yet watched the video above, please do so now. If you want to see more from Hans, visit GapMinder.org and see more videos or play with the data yourself! I believe that one of the keys to successful investing is to win the battle that takes place (in our mind) between our faith in the future, and our fear of the future. While we must live in a volatile world, we must act "AS IF" the future will be better. What is the alternative - to live in our self-made bomb shelter? We should have faith in the future because the facts support that faith. Things will not always be rosy, and are still downright painful for a great many, but progress and improvement will continue through both the good times and the bad. This progress is what we are investing in, and the world is benefiting. Faith in the future - from an investment standpoint - is simply the only view which is congruent with the historical record. If you don't have this faith, then the stock market will feel like you are participating in a speculative venture. The pessimists always get the headlines-even though optimists have far more often been right. There is immense vested interest in pessimism - as pessimism can get people to act and produce change for the better (which is good). However, we should never lose sight of the big picture - things are getting better and there is every reason to be optimistic.